A murder has taken place during a dinner party and your team has been called in to examine the evidence and determine which suspect will pay for their dastardly deed. Each team is given an iPad with an app that walks guests through a series of challenges and tasks. 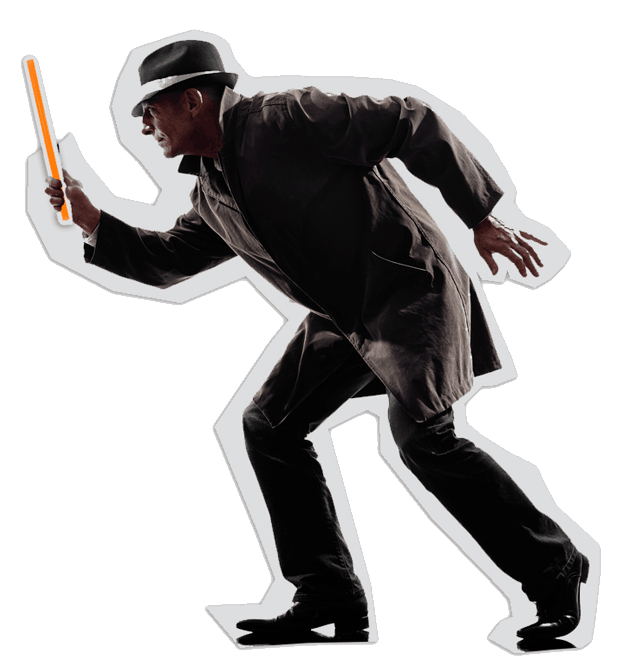 Guests score points as they answer trivia questions related to the suspects’ occupations and hobbies, examine evidence using augmented reality, piece together the timeline of events, and record their own photos and videos throughout the process including their recreation of the crime. 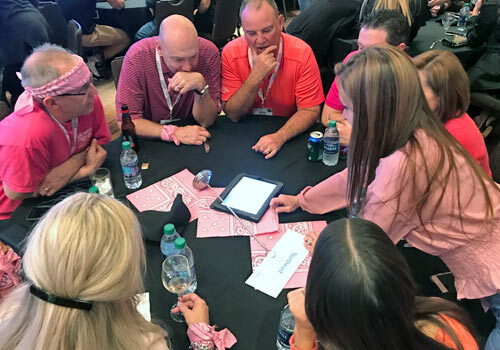 Old-fashioned fun meets new technology in the iPlay event, which finds teams competing in activities inspired by game show greats on an iPad at their team table. Guests may find themselves in “jeopardy” answering questions, trying to “name that tune,” using “concentration” to solve rebus puzzles and more. This is the perfect event if you want to help your guests escape boredom and awkward dinner conversation at your mealtime function. Tablemates will be intrigued by their centerpiece – a selection of locked boxes – and be captivated with the clues they must solve as they try to break in. What’s inside? Only time will tell! Want to mix things up and get your guests interacting? This event is one part progressive dinner and four parts fun. That’s because four games are served up throughout this team building dinner! One is played prior to guests sitting down during cocktails. Then three are played during a progressive dinner with guests changing tables after each course/game, or if you prefer, guests could stay put at the same table. After each game, the winning table gets a raffle ticket for a prize drawing at the end of the team building dinner. 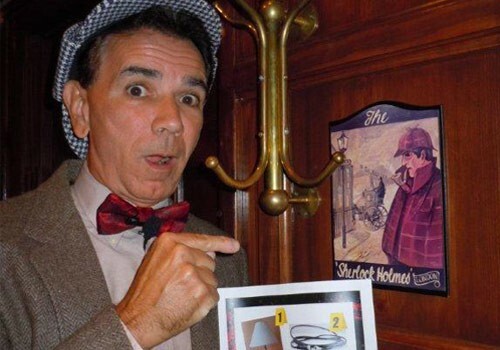 It’s no mystery – people love to guess “who dunnit!” But this isn’t your typical murder mystery! 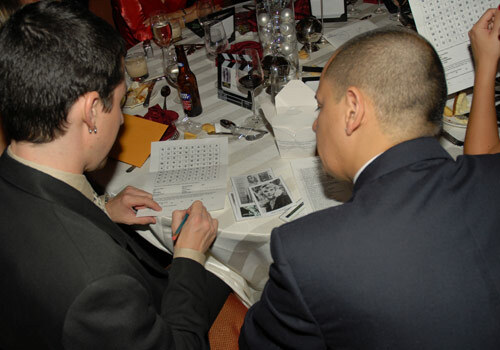 The mystery is customized for your group with clues being dropped at team tables between courses. And, the suspects turn out to be your own guests, who unknowingly are wrapped into the intrigue. Did somebody steal the company’s top secrets? Kill the competition? Steal the lollipops from the receptionist’s desk? If you can imagine it, we’ll leave no table unturned as we script a mystery that will intrigue and delight your guests. If you’ve ever been to a pub on trivia night or participated in a game show on a cruise ship, you know how much fun they are. The Not Your Average Pub Quiz builds on these concepts, taking them to the next level to entertain your guests. Your guests won’t be able to contain their excitement as they unleash their creativity and go bananas trying to create the ultimate tropical drink container out of the fresh produce provided. Will they create a hurricane glass out of a honeydew? A mug out of a melon? Your guests will drink in the fun! Everyone will have a winning time during this high-tech activity, no matter what’s on the menu, or when it’s held (over breakfast, lunch or dinner)! That’s because this event helps everyone connect – even if they’re a little chicken when it comes to starting up a conversation at a dining table with a bunch of strangers! A new course of challenges are released every 15 minutes via one tablemate’s own phone, giving guests time to eat in between each round. Plan Your Interactive Dinner Party Activity Today! No Table Unturned – “Thank you for a wonderful event at the California Grill last Wednesday night. Everyone gave the evening the highest marks—especially the team building event. Many commented how smoothly everything went and how well everything flowed. You did a great job roasting our “suspects”, and, as expected, all were good sports. If I can ever serve as a reference for this event, please do not hesitate to call me. Our client wanted to turn a sit-down dinner into a way for their board members to get to know one another better – a challenge we had to stew over because they were seated at six different tables! As guests began their meal, a detective ran in and gave them unappetizing information – $50,000 of their reserve fund had gone missing and they needed to help us figure out who stole the money! Tablemates worked together to solve clues that were incorporated into their meal. For instance, one clue could only be solved using the straws on their table. 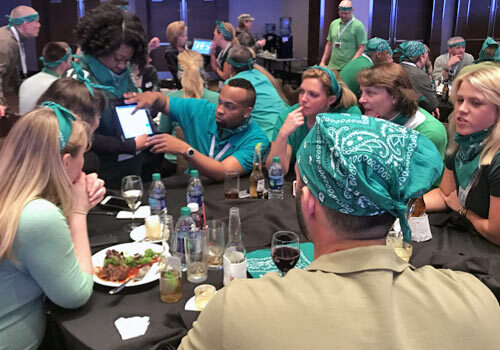 The group was whipped into a frenzy as they were surprised to discover the solution to each clue was an unsuspecting board member, who was grilled utilizing information poached by us before the event! Fortunately, all were found not guilty when it was discovered there was a decimal error and only 50 cents was missing from the fund! Ready to Plan An Interactive Dinner Party Activity? Contact Us Today.